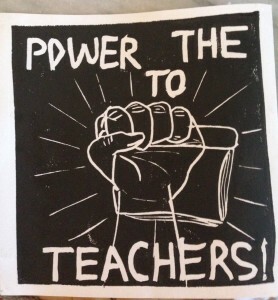 EYEWITNESS ACCOUNT: CHICAGO TEACHERS ON STRIKE! A highlight of the April 2016 Labor Notes Conference was a one-day strike by Chicago Teachers. This feisty union hit the streets to defend public education and linked up with parents and community to demand much more, including a higher minimum wage, an end to police brutality, and improved access to higher education. Doreen McGrath, an IBEW activist who attended the Labor Notes conference and joined the teachers picket line, reports on this exciting labor action.